What could be sweeter than a babe on a fluffy white blanket wearing pink ruffled bottoms? Not much actually. 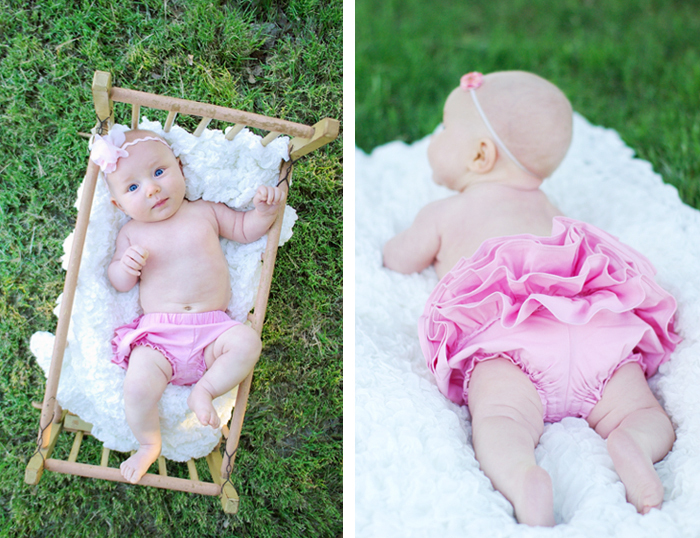 And the bottoms are even cuter because this babe's mother handmade them...one ruffle at a time. She said they were quite the headache. But quite worth it, I'd say. All went well without a single cry or whimper the entire shoot, except when at one point...as the little miss lay quite content in the doll bed staring at the trees...I suddenly heard a wail from her mother. I ran to see what was wrong, only to find that some unseen bird had pooped on the sweet baby's hand and arm. Disgusting. I commented that we were lucky it didn't land on her face...and at just about that point, the baby spit up. Apparently she was disgusted as well. But we got her cleaned up and finished the photos without any other problems. Good thing she's so easy going. It was even a little chilly too...which is nuts for us at the middle-end of May. WAY cute ruffles and I love the headband too! Close call with the bird doo-doo! Second pic is my fav! She has perfect porcelain skin. And I love the greenary, it looks like fairy-topia! Love the creases on baby girls thighs so cute. Can't believe the luck of the pooh.